The famous programmer and computer security Steve Gibson has released another useful tool. With Gibson's latest app, InSpectre, you can check if your system is safe and patched. This tiny free app for Windows can analyze your system and determine whether you're vulnerable to the Meltdown and Spectre security flaws. 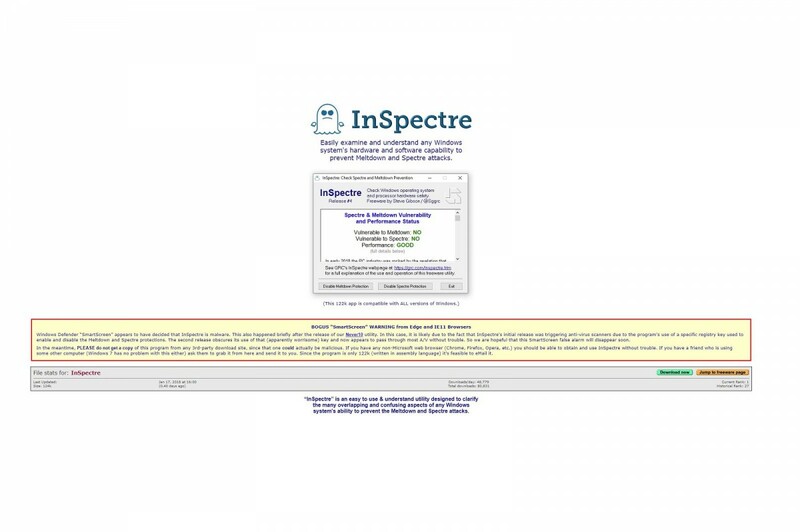 InSpectre is a rather small app and it's a free download from Gibson Research's website. The app will briefly scan your system to check if you're vulnerable to either of the exploits. Furthermore the software will offer a brief explanation if you are vulnerable. If you run InSpectre with administrative permissions, you can use it to enable or disable the fixes although it requires a system reboot each time. If you want check the performance implications of the patches of your system, you should check out this application. You can download this app on Gibson Research's website. We reccomend to use a non-Microsoft browser as the app is flagged as malware by Windows SmartScreen. Chrome or Firefox work without any issue.